Among the cancellations, one group decided to make a tour in March just after the quake. One of them said that, though it might be a tiny contribution, shopping in Japan would help the economy after the disaster. According to their words, they arrived in Fukuoka, western Japan, and headed for Kansai region. 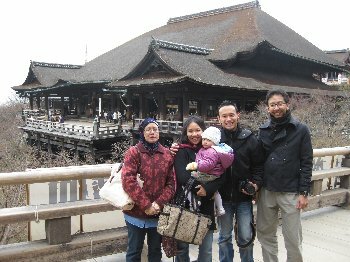 Ririko and I were their guide on each day during their stay in Kyoto. They are much interested in fabrics, so on the first day, Ririko took them to Nishijin texile center. There were few people because of the decrease in the number of the tourists to Japan. Seeing from the other point of view, they fully enjoyed the texile center without being annoyed by so many visitors, and not to mention they bought a lot of goods made of Japanese fabric. On the second day, I was a guide and showed them around in Higashiyama area. I suggested visiting Nishiki market to have them see our food culture. However they did like to see other kinds of fabrics in the shops along the path from Ginakuji temple, as well as Sanneizaka and Nineizaka. One of the members of the group found what is called Hachimaki. On one "hachimaki" said " Hissho!" (　必勝　) The direct translation is " must win " or " a strong will to win" . According to the translation on the paper board in the shop said "Sure victory". It sounded a little strange to me, but he really liked these words and bought one. In addition, he bought another one for his friend. He repeated again and again "Sure Victory" "Sure Victory" He seemed so happy to have one. So I asked a silly question to him. "If you have one, you will surely win, right? But in the case you have to fight against the friend you give the other 'Sure Victory' to, who will win??? You have to hold two hachimakis to make sure the victory? " That was funny to us. We enjoyed our tour so much. In kamanza, they serve yuba-donburi. It's one of the specialities in Kyoto. It is very simple donburi but worth trying if you like Japanese soup and tofu.